Napkins are more than just something to keep food off your clothes; they are a part of the overall decor of your party. The napkin you choose must fit with the rest of the tablecovers, plates, etc. We have several types of linen-like napkins that have the look and feel of linen, but at a much lower price. You can get them in various designs or classic white. 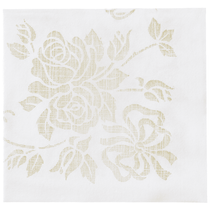 We also have paper napkins that feature floral patterns, unique artistic patterns and more. If you've ever wanted something truly out of this world, then choose some of our origami dinner napkins. They look just like flowers. 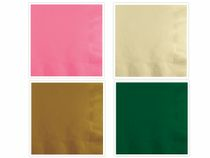 You can have monogrammed napkins or choose napkins in a variety of solid colors. Our party supplies are top of the line, so you know you're getting the best available.